Fuji finepix S7000 digital camera, Radio Shack boundary condenser microphone (omni directional) 33-3022, Panasonic RR-US360 digital recorder, Sony TCM-200DV cassette recorder, Non-contact IR thermal probe scanner, Tri-field natural EMF meter (x2), Tri-field meter (x2), Temperature gauge (x2), EMF gauss meter (x2), Apple G4 laptop, Radio frequency counter, Hall Effect Gauss meter from Integrity Design and Research Corporation (IDR-309). A bare probe was used with the gauss meter. The bandwidth of the bare probe is 68Hz at 3dB, Sper Scientific Electromagnetic Field Test 840025 EMF meter, Bandwidth is 30 to 400Hz with 4% accuracy at 50Hz/60Hz. Data is displayed as mG, Air ion Counter, Positive and negative ion counts are displayed as ions/cm3, Sony Digital Handycam DCR-TRV19 NTSC with night shot, All sound data was digitized and processed using Acid Music 4.0 and Audio Cleaning Lab 3.0. Potential EVPs were analyzed using Goldwave and Raven software. Automated Data Collection System (ADaCS), Triaxial ELF magnetic field meter with pc interface, The meter has a bandwidth of 30Hz to 2000Hz and an accuracy of +/- 3% at 50Hz/60Hz and +/-5% at 40 to 200Hz. Data was logged using the supplied software., HOBO Temperature data logger from Onset Computer Corporation with data logging and archiving ability. Software provided by Onset Computer Corporation was used for data logging and archiving., GM-10 radiation detector from Black Cat Systems with pc interface. The Radiation Acquisition and Display (RAD) Software was used to log and archive the data. Radiation detected includes alpha, beta, and gamma/x-ray. Data is displayed as counts per minute (cpm)., Panasonic Toughbook CF-45 laptop computer. Tri-field natural EMF meter modified to be data logged by the HOBO data logger. CAUSE FOR INVESTIGATION - The owner of the location contacted various members of the SWPRG for help. She reported strange occurrences have happened, such as: water bowls moving, phone being thrown off the charger, lights turning on and off, smell of strong urine and various other smells, cold spots, animals following things with their gaze, animals hiding or acting upset at unseen things, door knobs turning back and forth, doors opening, a dresser creaking, the owner's brother was dragged by the legs while sleeping, and the detection/sighting of various entities. The most concerning incident to the owner was the belief that there was an illegal spiritual taking of her dog. Upon arriving at the location, there was a brief tour of the location for those who did not attend the pre-investigation. The equipment was set up and the investigation group split up into two teams. 1. Surveillance cameras were placed in the second floor bedroom, second floor main room, stairway to the second floor, and in the dining room/kitchen area. All video was captured on the DVR. 2. The automated data collection system (ADaCS) for EMF, natural EMF temperature, and radiation was set up and run in the second floor bedroom and the second floor main room. 4. The two teams did various data sweeps of their assigned areas. They recorded video, took pictures, measured temperature, EMFs, natural EMFs, and logged all data and personal observations. 5. EVP sessions were conducted in the second floor bedroom and the second floor main room. A digital recorder was also left running in the second floor bedroom. 6. Quiet observation in the dark was done during various time throughout the night. Nothing of note was seen in any of the pictures. * 'Normal' ion counts are usually in the +/- 500 ions/cm3. * High concentrations of positive ions have been associated with irritability and negative moods while negative ions have the opposite effect (Charry and Hawkinshire, 1981). Gauss meter readings of 400 to 600mG were recorded throughout various locations in the house. Normal readings are within the same range. 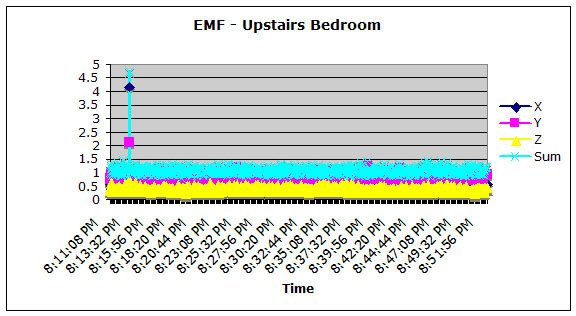 An EMF reading of 25 to 40mG was noted in the second floor bedroom closet. Investigators noted that outside power lines come over to the house at that location. There was an area in the main room on the second floor where the EMF reading would increase to 8 to 10mG for a few minutes and then return to 1 to 2mG. No definite source was located for these EMF readings. * There is an EMF 'spike' of 4.737mG at 8:13;14pm in the second floor bedroom. This correlated with a radiation 'spike' of 25cpm. 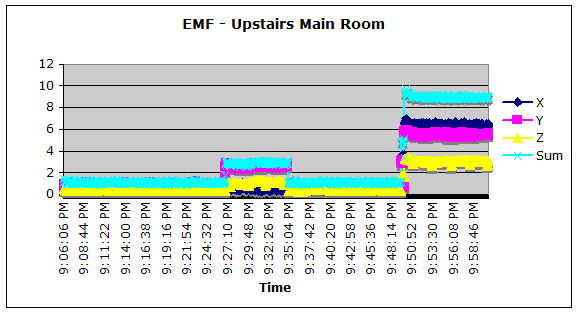 * The increase in EMF seen in the upstairs main room between 9:26:52pm and 9:34:54 correlates to the EMF increases that other investigators were reporting in that room. At 49:28pm the equipment was moved to the area where investigators reported the EMF increases. EMF readings of 8 to 9mG were recorded as seen in the graph above. * Unexplained 'spikes' in EMF have been reported in other locations where there are reports of paranormal experiences. 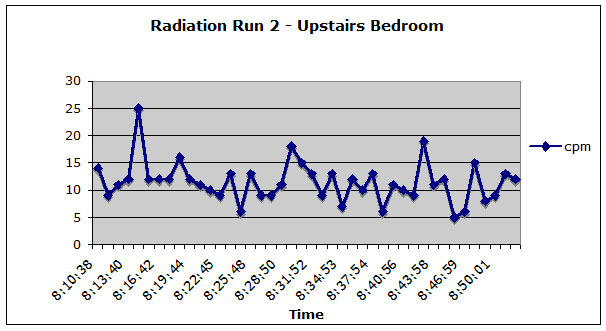 The two graphs below show the data collected for the upstairs bedroom. There was nothing of note for the upstairs main room. * There is a 'spike' of 25cpm at 8:14:40pm. This occurs within the same time frame as the EMF 'spike' noted above. * There is a 'dip' to 3cpm at 7:43:19pm. Nothing else happened at this time. Other researchers have noted drops in radiation in areas with reported paranormal activity. There was nothing of note for the ambient temperature readings taken at any of the locations. During the pre-investigation on July 27th, 2005 a radio in the upstairs bedroom possibly came on by itself. The second time investigators visited that room they noticed that the radio was on and was increasing in volume. They did not notice the radio being on the first time they were in the room. The video that was shot during the pre-investigation was reviewed and did confirm that the radio was not on the first time the investigators were in the room but it was on the second time they were there. Two potential EVPs were recorded. The first occurred during the EVP session in the upstairs bedroom. An investigator asked, "How old are you?" The EVP below is what was heard upon review of the digital recording. The second EVP occurred while the digital recorder was left running in the upstairs bedroom. Two investigators were discussing equipment take down and a third voice was found upon review of the recording. It seems to be part of the conversation. Dave Schumacher and Jennifer Lauer returned to the residence on September 26, 2005 to reveal to the homeowner the information and data they collected. During the visit, while sitting at the kitchen table reviewing the 2 E.V.P's that were recorded, they clearly heard 5 or 6 distinctive footsteps on the 2nd floor. They more than just heard it....they felt the vibration of the footsteps. Immediately, the two investigators and the homeowner ran upstairs....there was NO ONE THERE! The homeowner was very happy...she stated, "Finally, Someone else was here to hear that. This is what I've been experiencing myself"